ITS FRIDAYYY!! Thank goodness, although my weekend starts Thursday afternoon, still its Friday :) I hope you alllll enjoy your weekend with a little sparkle. What girl doesn't love sparkles. When Revlon debut these colors I literally fell in love. First Revlon's Starry pink is pink, so anything pink is an eye catcher for me. Then once I seen the silver hex glitter I knew it was me. However, I was a little disappointed and should have known that it wouldn't be the most opaque nail polish. Although, it isn't very opaque after about two - three coats it can get opaque. The more coats you apply the thicker the polish gets, and the longer it takes to dry, which for me means in my case their will be a lot of dents, and its more prone to chip. So I suggest you apply a lighter similar color underneath therefore, you apply less coats. Although, this picture was taken a few days ago when I first applied it. Since then I did apply essies marshmallow underneath starry pink and I absolutely love it! I think any color would really look great, its just your personal style/ preference. On my middle finger I applied Revlon's Facets of Fuchsia which quickly became a fall favorite. It is a similar dupe to Deborah Lippmann Bad Romance.Although, I don't have this color it does seem pretty close. It is a black based purple with thick purple glitters. This color does take two coats to be opaque which isn't bad, and the formula is a lot easier to work with. It dries pretty fast, and I would say it doesn't chip as easy as Starry Pink. 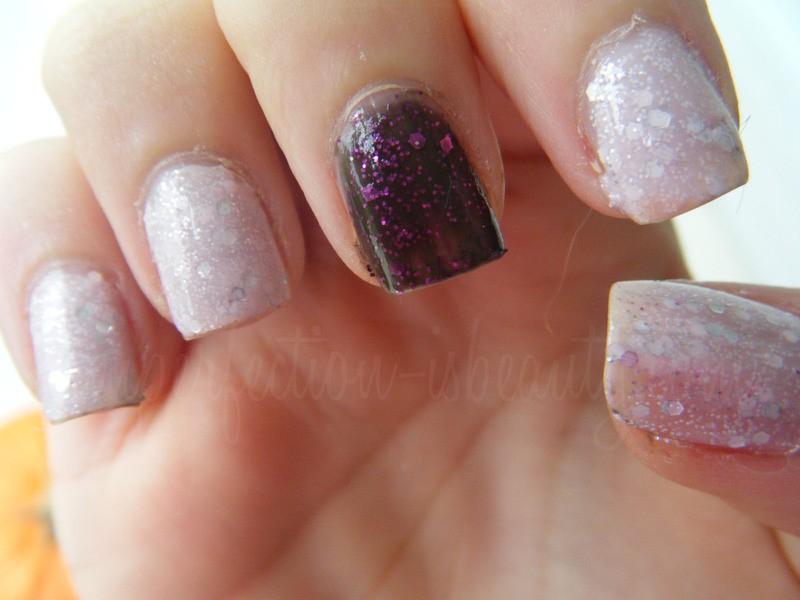 Overall I love both of these glitter polishes. They're both super gorgeous, and girly. Starry Pink's formula is a little thicker, and is a lot prettier and easier to apply with a color underneath, the consistency isn't all that great but I still love it. 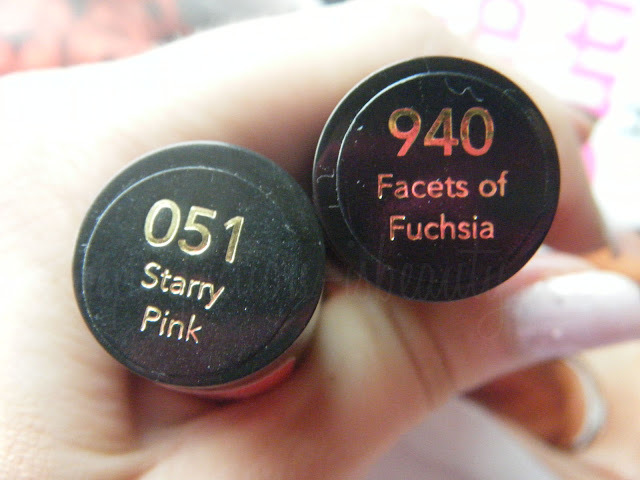 Facets of Fucshia's formula is a little thinner, and dries super fast. Right now Revlon nail polishes are 40% at Rite Aid until about Sunday. I like facets of fuchsia! I love the 2 colors. Did the polish come off easy? i find glitter polish so hard to get off. yay! pretty so prettty! love your nails.. aww so happy to be back! I actually saw FoF first and thought I would love it, but I ended up getting both and my love for Starry Pink superseded my initial love for FoF. FoF is really junky as far as opaqueness goes. Super cute nail art!!! By the way, I love the new header. So fabulous! @CottonCandy with another color underneath its even prettier. @pinkglam eh its kinda difficult to remove but not to bad. @sarabel ya but what nail polish is opaque after one coat? Not many now a days. very cool. i love revlon polishes! I really like glitter polishes lately. They look gorgeous and stand out in the fall weather. Yay, so glittery and pink. I like facets of fuchsia. I wanna try!! these are GORGEOUS! 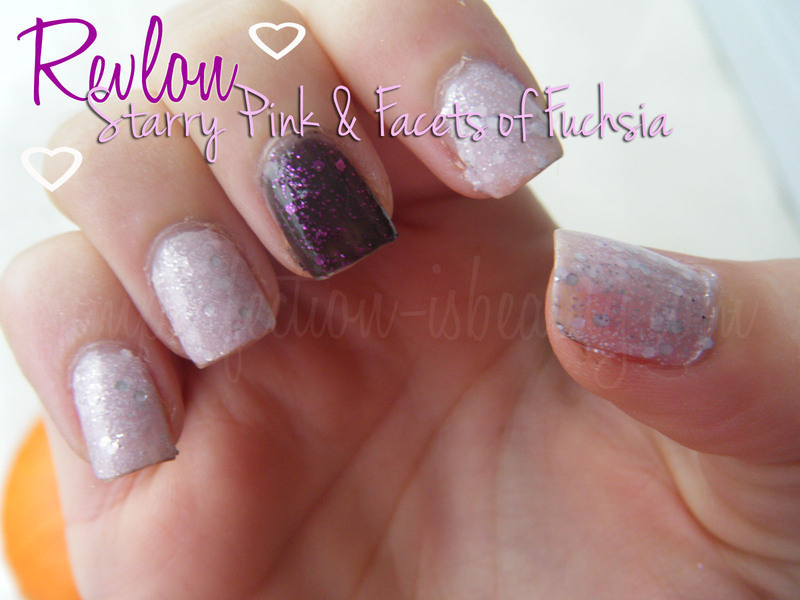 I neeeeed to get facets of fuchsia!